Matins and Divine Liturgy are served on Sunday morning. Vespers is an evening service typically done on Wednesdays and Saturdays. More info. Check the calendar for the actual schedule. The Divine Liturgy starts at 9:30AM and is usually over by 11. Before the Divine Liturgy starts there is a service called Matins (Orthros). 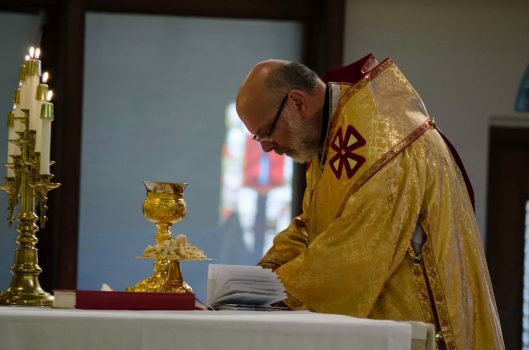 There is no break between the end of Matins and the beginning of Liturgy, one flows directly into the other, so when you arrive for Divine Liturgy at, or a little before, 9:30 it may seem like you’re late but you’re not. You’re probably catching the end of the Matins service. There are service books that will help you to follow along with the Divine Liturgy. There will be greeters to meet you to assist and answer any questions you may have. They will be able to assist you in getting seated and provide you with a service book to follow along in. An Orthodox service can be overwhelming on your first visit. Vibrant images of biblical events and saints cover the walls. You will see people lighting candles and venerating icons. The smell of incense fills the air. People will not only be using their voices to worship, but also their bodies. They will be crossing themselves and bowing or prostrating. It may seem strange at first, but this is how Christians have worshiped God for 2,000 years. Every week after Liturgy we have a large potluck lunch. Please do not plan to bring anything, but please do plan to eat with us. It would be our honor to have you as our guest. Parking can be difficult at St George, so we have two spots in the lower parking area near the stairs that are reserved for guests. Please take advantage of them. There is an upper parking lot that is accessed by the first alleyway on Park. Heading south on Park make your first right in the alley way. Going up the hill you will pass an black iron fence on the right, then an opening on the right. Enter that opening to access the upper parking lot. Many of our parishioners also park along the street on Park as well. There is also another parking lot catty corner of the church behind the Dorn Homes building that we were given permission to use. You can access this parking lot of of Grove. If you are used to going to other churches, you may expect there to be a Sunday School for the children while adults attend the main service. In the Orthodox church, children are full-fledged members of the church and attend services along with adults. This may be challenging for parents if it is their first time visiting. A little noise and a little movement from children is not a problem. It is to be expected. We would only ask that if your child begins crying loudly to please take them outside till they calm down, and then return to the service. You will see this happen throughout the service with other families. It is perfectly OK. The important thing is to participate in the service as a family and to know that we are glad you are with us.